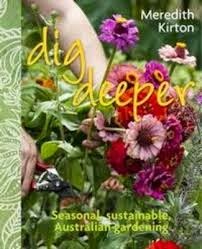 Dig Deeper, Seasonal sustainable Australian gardening is the 5th book by Meredith Kirton. Published by Murdoch books, Dig Deeper is a great reference point for any gardener. Dig Deeper came to me at a time when starting my Spring vegetable garden was whirring through my mind. I had just moved into a new home and was pondering where to plant and what to plant. Dig Deeper was all I needed to motivate me and answer my questions. Over the years I have become frustrated with gardening books, finding they were either not relevant to the Australian climate or poorly set out. Dig Deeper provides an easy reference point in the form of an index and, with a layout that is set in seasons, one can easily source what to plant at the current time or help a struggling plant with the current weather. Being a seasonal gardener I love the fact that at the beginning of each new season all I need do is open Dig Deeper and start my gardening journey. Dig Deeper by Meredith Kirton is visually delightful. From the hard cover to the inner photo's it invites, welcomes and begs the green thumbed reader to look further within. The full colour photography catches the change in seasons beautifully, providing an informative visual layout that compliments the written word. Dig Deeper is a high quality book that will last on the shelves for many years to come. It would make a beautiful gift for the avid gardener. As far as gardening books go I cannot praise Dig Deeper Seasonal, sustainable Australian gardening by Meredith Kirton enough. I find it hard to find faults in this book which has already become a well used point of reference. This is my first Meredith Kirton book and it will definitely not be my last. Thank you Meredith Kirton. My Spring vegetable patch is flourishing like never before with my strawberries, that use to call for attention, producing mouth watering fruit in abundance. My lavender loves me now and it is all thanks to Dig Deeper.